Using a neuron-specific retrograde gene-transfer vector (NeuRet vector), we established immunotoxin (IT)-mediated tract targeting in the primate brain that allows ablation of a neuronal population constituting a particular pathway. Here, we attempted selective removal of the cortico-subthalamic “hyperdirect” pathway. In conjunction with the direct and indirect pathways, the hyperdirect pathway plays a crucial role in motor information processing in the basal ganglia. This pathway links the motor-related areas of the frontal lobe directly to the subthalamic nucleus (STN) without relay at the striatum. After electrical stimulation in the motor-related areas such as the supplementary motor area (SMA), triphasic responses consisting of an early excitation, an inhibition, and a late excitation are usually detected in the internal segment of the globus pallidus (GPi). Several lines of pharmacophysiological evidence suggest that the early excitation may be derived from the hyperdirect pathway. In the present study, the NeuRet vector expressing human interleukin-2 receptor α-subunit was injected into the STN of macaque monkeys. Then, IT injections were made into the SMA. In these monkeys, single-neuron activity in the GPi was recorded in response to the SMA stimulation. We found that the early excitation was largely reduced, with neither the inhibition nor the late excitation affected. The spontaneous firing rate and pattern of GPi neurons remained unchanged. This indicates that IT-mediated tract targeting successfully eliminated the hyperdirect pathway selectively from the basal ganglia circuitry without affecting spontaneous activity of STN neurons. The electrophysiological finding was confirmed with anatomical data obtained from retrograde and anterograde neural tracings. The present results define that the cortically-driven early excitation in GPi neurons is mediated by the hyperdirect pathway. The IT-mediated tract targeting technique will provide us with novel strategies for elucidating various neural network functions. Figure 1. Schematic representation of the experimental setup and time-course. A: Experimental setup. A pair of bipolar stimulating electrodes was placed in the forelimb region of the supplementary motor area (SMA). A glass-coated Elgiloy-alloy microelectrode was inserted obliquely into the internal segment of the globus pallidus (GPi) for extracellular single-unit recording. The NeuRet-IL-2Rα-GFP vector was injected into the SMA-recipient territory of the subthalamic nucleus (STN) according to the mapping of cortically evoked responses therein. Four-to-six weeks later, immunotoxin (IT) was injected into the SMA forelimb region. Cd, caudate nucleus; GPe, external segment of the globus pallidus; Put, putamen. B: Experimental time-course. 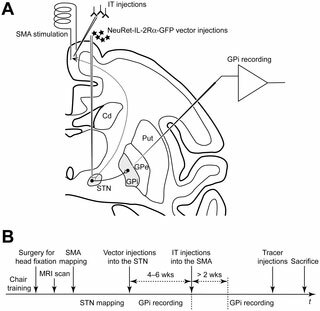 Neuronal recordings from the GPi in a control condition were performed before the IT injections into the SMA. Later than two weeks (wks) after the IT injections, GPi recordings were resumed.